I did warn you earlier this month that our family has many birthdays in August. Here is yet another birthday card. 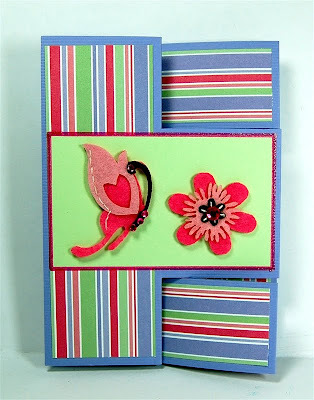 This one is a "tri-shutter" card - one of my favorite styles to make. I have posted several other cards in this style - here is a LINK to the older posts. Scroll down to the oldest two posts to find all of the directions on how to measure, score and fold these cards along with the dimensions of the layering pieces. Here is the closed card. I used both striped and solid papers for the layers and outlined the solid paper with a Martha Stewart glitter pen. I used some of the felt embellishments from Creative Charms to decorate the card. These are part of the August "Deal of the Month" in Pink and you still have a couple of days left to place an order for the pink or blue deal. 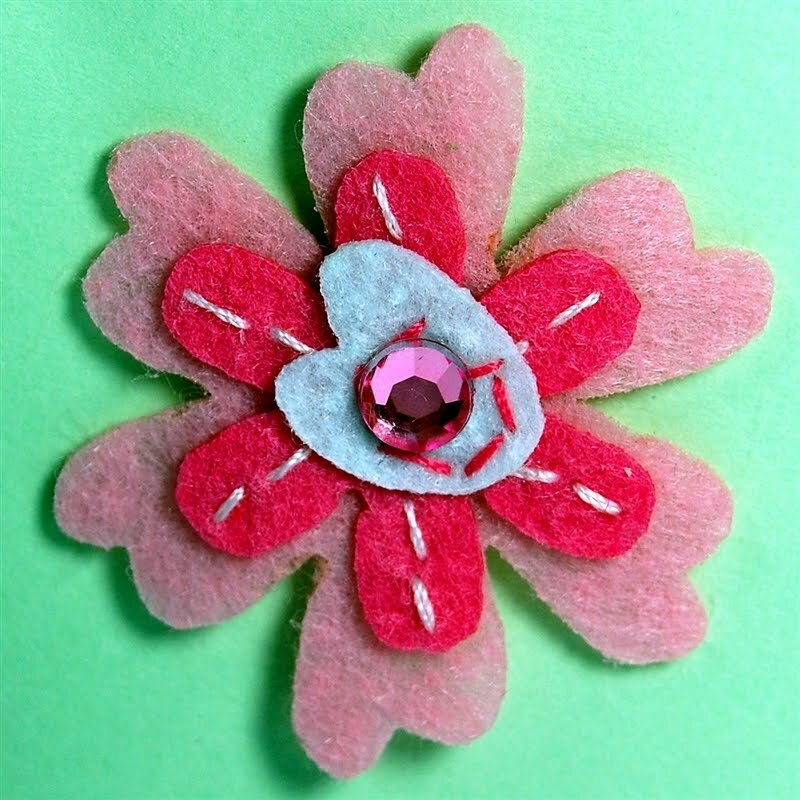 Here is a LINK to the page on the Creative Charms site. 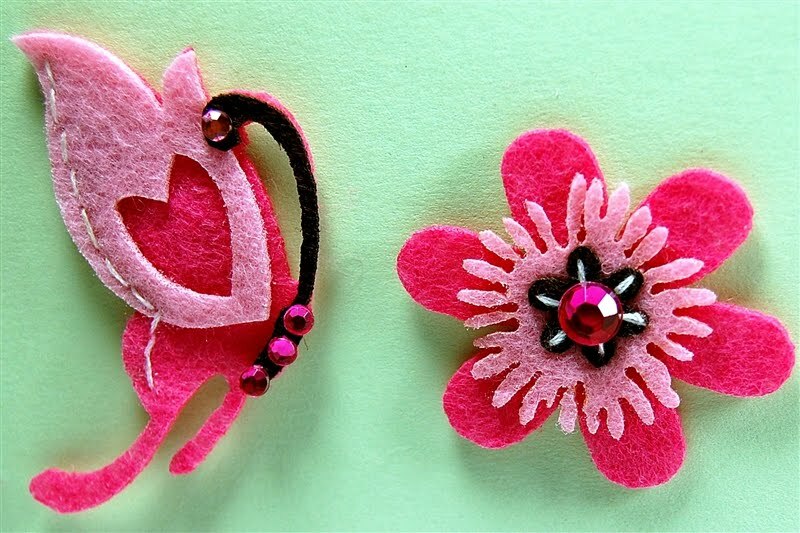 I added some pink gradient gem stickers to decorate the felt embellishments. 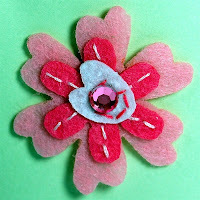 I used the darkest pink on the butterfly and flower on the front of the card and the medium pink on the inside flower. These were also part of the Deal of the Month. 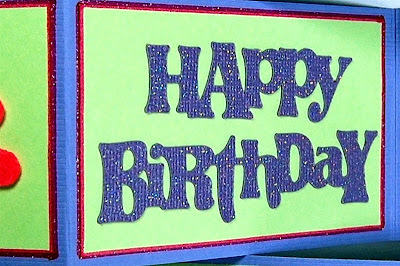 I used the Core'dinations Core Couture glitter cardstock for the "Happy Birthday" inside. 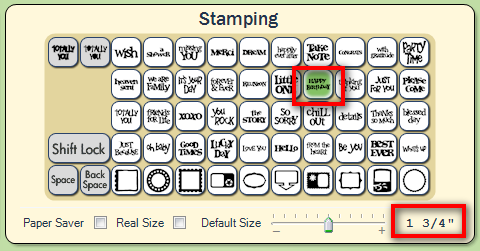 The sentiment is from the "Stamping" Cricut cartridge. This is a solutions cartridge (not to be confused with the "Stamped" full cartridge) that is often overlooked. There are lots of simple sentiments and some wonderful frames on the base level. The shift level is full of great images that have a shadow and a blackout option so you can make three layered images. 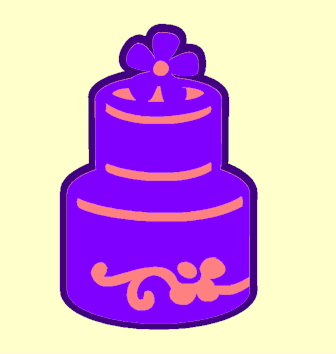 Here is an example of the cake. The shapes are relatively simple since this cartridge was designed to be used with the Cricut Cuttables stamp material to make your own rubber stamps. I have had this cartridge for quite a while but had not used it recently. I used Design Studio to search for the various "Happy Birthday" sentiments and found quite a few. 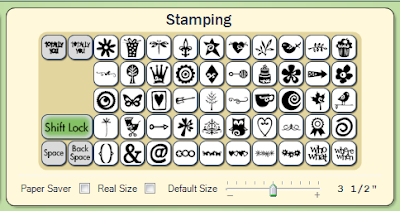 The screen shot above shows some of them. Using Design Studio I was able to choose the proper size for my cut and then just go downstairs and quickly make the cut the "old-fashioned" way (yes - I actually pressed buttons on the keypad for a change!). Here is one more view of the card that shows the folds and angles a little more clearly. The blank area by the second flower is for a hand written note. 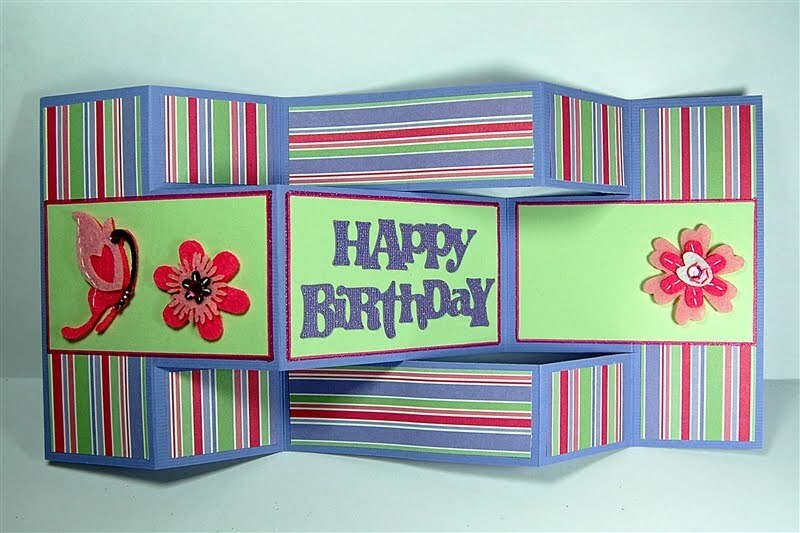 If you like this style of card, you can make up some of the base cards in various colors, add the layers and keep them ready to decorate with sentiments and embellishments for the occasions when you need a quick card. 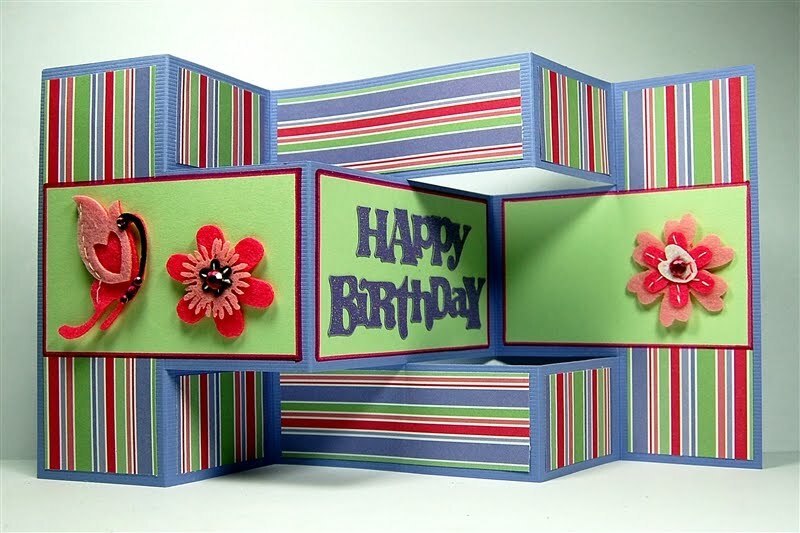 People are usually enjoy this style of card because it is a bit different and it is also fun to try to figure out how it was made! Now I have to tell you about something nice that happened today. I left my Dad's to head up to New Jersey but couldn't resist stopping in the local shopping plaza where there are both a Michael's and an A.C.Moore store right next door to each other. 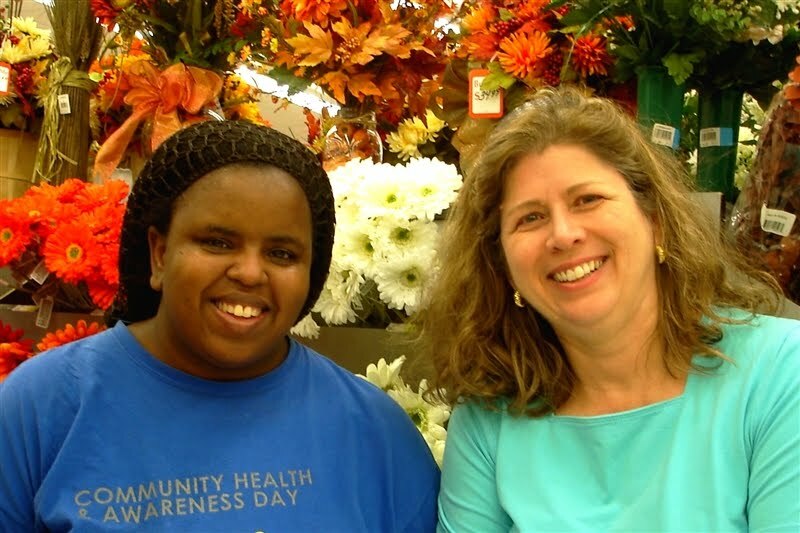 I was doing a quick cruise of the aisles looking for any great sale or clearance items and I heard someone say something along the lines of "that woman looks so familiar - I think she's the one on the computer." I looked up and realized that I was the woman she meant. Kimberly recognized me from my blog and the message boards! We had a nice chat and of course "talked Cricut" while her patient daughter waited. Ashley snapped this photo of us with my little purse camera and I told Kimberly I'd give her a shout out on today's post. It was fun to be "recognized" and Kimberly had some very flattering things to say! I also found out that Kimberly has a blog. It would be fun if some of you would head over there and say "hi!" and tell her I sent you. Kimberly's blog is HERE and you will find many lovely cards that she has made and shared. Diane, I absolutely love this card. The colors are fabulous, and now I have to check out that solutions cartridge. How fun to meet someone like that! I love these tri-shutter cards and yours is beautiful. What a lovely way to meet with someone who follows you. Great idea to make the card base and add latter. I love your card. So Nice of you to give a shout out to Kimberly. I went to her blog and found some new ideas. 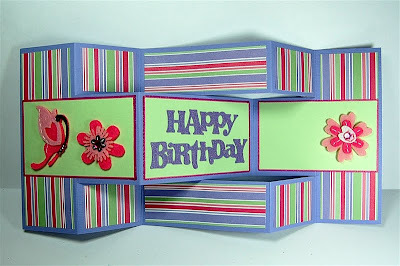 I love this card and the bright colored paper. I think I'll make some of these to have around for special occasions. How nice of you to stop and spend time with a total stranger. I'm sure you really make her day. I know you would make mine if I met you in person. Went over and said hello to Kimberly. How fun for her! I love this card. It is my go to card when I need a special card. Okie has a cut file for the card and all the pieces which makes it so very easy to complete in no time. Diane, super fun birthday card, so lovely and such a wonderful meeting you had! I've been wanting to make one of these cards for a long time. Thanks for the directions. I'll have to check them out.